LAGUNA BEACH, CA--(Marketwired - December 06, 2016) - Tickets for the much-anticipated 2017 Pageant of the Masters are on sale now and make the perfect holiday gift for the art lover on your list. This holiday season share the excitement with tickets to next summer's production of The Grand Tour. The Pageant of the Masters will be performed nightly from July 7 through August 31, 2017. In the 17th and 18th centuries, the desire to experience the world's great art firsthand inspired the European tradition of continental travel on the Grand Tour. Inspired to set out on pilgrimages by land and sea to the great cultural centers of Europe, and eventually the globe, those early travelers often risked life and limb to stand in the presence of masterpieces. It's that original dedication to expanding one's horizons by visiting the great art centers of Europe that fueled Pageant Director Diane Challis Davy's excitement and research as she fine-tuned plans for next summer's production, The Grand Tour. "Perhaps because I do so much virtual traveling via Google," Challis Davy offered, "I have a fantasy about actual travel and sightseeing. I was curious about the tremendous difficulties travelers encountered in the 18th century, with horse-drawn coaches on unpaved roads and no railways, no hotels. Even restaurants hardly existed, and there were virtually no public museums." There'll be no shortage of masterpieces in the 2017 Pageant, including works by Leonardo da Vinci, Tiepolo, Longhi, Watteau, Reynolds and Romney. But, as in previous years, the production's theme will expand to include American artists like John Singer Sargent whose work was transformed by his travels. With the coming of the 20th century, new modes of transportation made it possible for almost everyone to go on their own "tourists' grand tour," and the theatrical possibilities assure no shortage of Pageant-style fun and inventive showmanship. A side trip to Pompeii, a celebration of Carnival in Venice and the European tour of Buffalo Bill's Wild West Show offer abundant opportunities for surprises and special effects. And a tribute to Paris in the early 20th century when audiences in clubs embraced the talents of Josephine Baker, Louis Armstrong and Duke Ellington reveals how a change of scene can launch an artist's career. As always, Challis Davy and her staff realize the Pageant wouldn't be possible without their volunteers who make it their summer destination, traveling from all over the Southland and returning year after year to take part. Challis Davy offered one final thought, "The Grand Tour is about travel for pleasure. And what greater pleasure can there be than to find oneself in the presence of great art at the end of the journey?" As an added value, a Pageant ticket also gives unlimited admission all summer long to the Festival of Arts Fine Art Show. Advance tickets are $15 - $230 and may be purchased by calling 1-800-487-3378 or online at www.PageantTickets.com. The Pageant of the Masters is arguably one of the most unique productions in the entire world. Audiences are amazed and enchanted by ninety minutes of tableaux vivants ("living pictures"), incredibly faithful re-creations of classical and contemporary works of art, with real people posing to look exactly like their counterparts in the original pieces. A live narrator guides patrons through the story of each living picture accompanied by a full orchestra. The Festival of Arts is a non-profit organization that produces the Festival of Arts Fine Art Show and the Pageant of the Masters. Proceeds support the arts in Orange County. 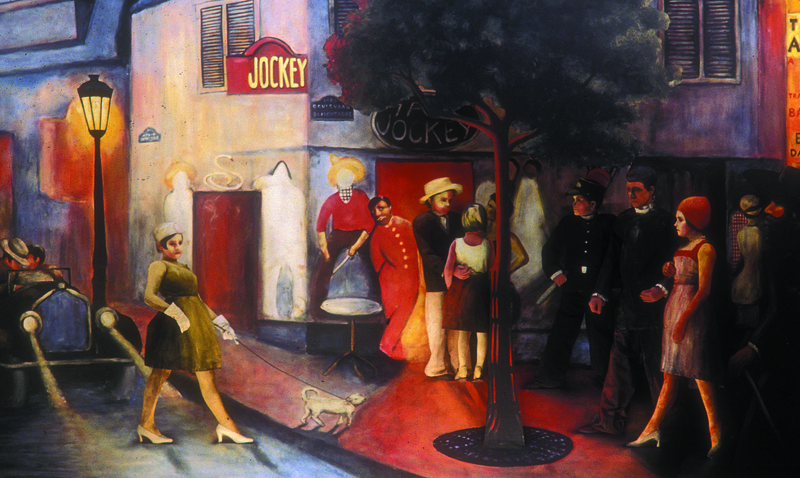 Pageant of the Masters re-creation of Archibald Motley's The Jockey Club to be featured in next year's show, The Grand Tour.